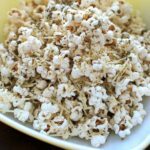 Pizza popcorn is a perfect snack for movie night that's still pretty healthy and full of flavor with herbs and parmesan cheese. In a small bowl, combine oil or melted butter and stir together with 1 teaspoon of the herbs. Pour over popcorn and toss until combined. Top with remaining herbs, parmesan cheese and salt.